The tandem rotors are both high above the fuselage. And the two engines are externally outside the rearward of the fuselage, the rotor on the head is driven by the rotors with a transmission shaft on the top of the cabin. This design means that the aircraft had a 50 feet long cabin capable of carry up to 45 fully-equipped troops, or 10 tonnes of cargo, or 155mm howitzer, or small vehicles internally or externally on one of three mopunting points, without any structure limit. That`s why the tandem rotors is chosen. At the end of the cabin, the tail of CH-47, there is a rear loading ramp door, easily load or unload the cargo. The small vechiles can be driven out of the cabin by themselves through this door. Two big size side doors are on the aircraft, too. The large payload makes CH-47 an ideal battlefield support aircraft. Another good point of the tandem rotors is that no tail rotor is needed to counter the torque so that the power efficiency is excellent. But this counter-rotation also causes a problem that the blades must be synchronized to avoid them touching another one. And because the CH-47 is a large size helicopter with a 60-foot rotor span, the effective length of the whole aircraft is up to 100 feet while landing or takeoff. 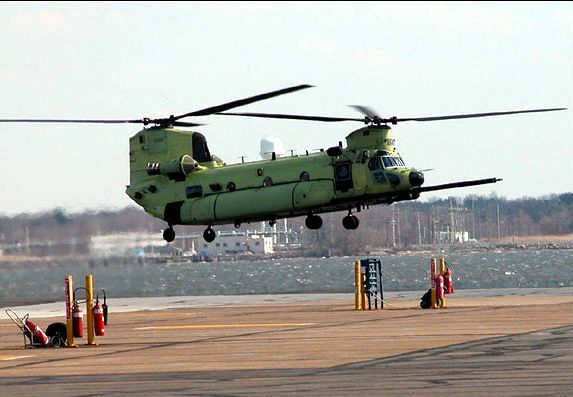 The CH-47`s maximum airspeed is 185mph which effected by load configuration and circumstance situation. The crew for tactical operations is normally two pilots, one flight engineer and one crew chief. June 25 1958, the US Army issued an invitation for a Medium Transport Helicopter. Five aircrafts of Boeing selected to produce the YCH-1B as the Army`s new medium transport helicopter. In July 1962 the CH-1B was redesignated as the CH-47A. 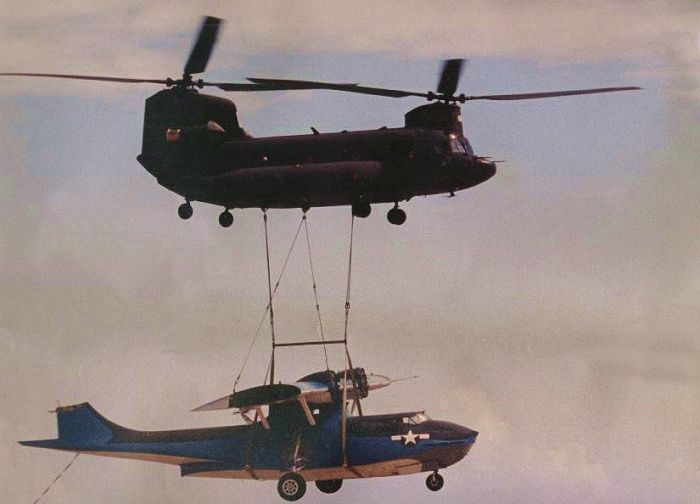 In 1962 the CH-47A was first delivered for use in Vietnam. The Chinook's mission is carrying artillery, ammunition, personnel, and supplies on the battlefield. It also performs rescue, aeromedical, parachuting, aircraft recovery and special operations missions. Early production CH-47A`s operated with the 11th Air Assault Division during 1963. In October the aircraft was formally designated as the Army`s standard medium transport helicopter. June 1965, the 11th Air Assault Division was redesignated as the 1st Cavalry Division (Airmobile) and readied for Vietnam. Chinooks formed the nucleus of the 228th Assault Helicopter Battalion which began operations in Vietnam in September, 1965. At that time CH-47As were equipped with Lycoming T55-L7 engines generating 2650 shp. The aircraft had a maximum gross weight of 33,000 pounds allowing for a maximum payload of approximately 10,000 pounds. But the hot mountainous conditions of fareast cut down the A models` capabilities. Then comes the more powerful CH-47B with the Lycoming T55-L7C engine, which was introduced by Boeing after a production run of over 350 CH-47A`s. On the B model there are nonsymmetrical rotor blades to increase the stability. The CH-47B began to be produced in May of 1967 and eventually produced 108 B models before production shifted to the C model. The CH-47C has a improved center cargo hook whose capacity is 20,000 pounds. This center hook must be used when hooking a single load. The other two hooks, one at the fore and another at the aft, can carry 10,000 pounds each. Designed to meet an Army requirement to transport a 15,000 pound sling load over a 30 mile radius, the C model boasted an increased gross weight to 46,000 pounds, increased fuel capacity, the Lycoming T55-L11 engine developing 3750 shp, and addition structural improvements. The first CH-47C flew in late 1967. Production of it continued until 1980 with crash worthy fuel system and fiberglass rotor blades. June 1976 contract for a modernized Chinook brought out the CH-47D, one of them in the photo down here. At that time the older variations almost came the end of useful life so they all needed to be replaced. Three aircrafts, one CH-47A, one CH-47B, and one CH-47C were rebuilt with improved systems to provide three CH-47D prototypes. The upgraded power plants, Allied Signal Engines T55-L-712 3,750 shp turboshaft engines, rotor transmissions, integral lubrication and cooling for the transmission systems, and fiberglass rotor blades make the CH-47D a brand bran-new CH-47. Other improvements included a redesigned cockpit to reduce pilot workload, redundant and improved electrical systems, modularized hydraulic systems, an advanced flight control system. The CH-47D has a maximun speed of 163 mph(142 knots). The CH-47D carrys twice heavier than CH-47A while the performance improved. With the advanced avionics, the CH-47D can operate at dark night and in nearly all weather conditions. An air-to-air refueling probe added on, too. The D models can also accommodate several kinds of internal payloads, vehicles, artillery pieces, 33 to 44 troops, or 24 litters plus two medical attendants. The "D" model can carry up to 26,000 pounds externally on its` three cargo hooks. The arms on board can be two side door mounting M60D 7.62mm machine guns on the M24 armament subsystem and a ramp mounting M60D using the M41 armament subsystem, the photo shows these. In 1991, during Gulf War the CH-47D often worked as the only helicopter of transportation of Army to carry heavy cargo rapidly over the vast area. The cargo capacity and speed provided commanders and logisticians a capability unequalled by any Army in the world. During the ground phase the flanking maneuver executed by the 18 Airborne Corps was planned with the CH-47D as the keystone. In a representational air assault 5000 soldiers was trandported by a total of 126 UH-60 Blackhawks and 60 Chinooks. Just in the first day the CH-47Ds had lifted 131,000 gallons of fuel along with pallets of combat-configured ammunition for the next day's full attack. And forty separate refueling and rearming points were active in less than two hours. That is what the "keystone" means. After the Cold War, the CH-47D joined the peacekeeping operations in Bosnia. 16 Chinooks flew 2,222 hours, carried 3,348 passengers, and transported over 3.2 million pounds of cargo over a six month operation. These numbers equate to carrying 112 infantry platoons, 545 HMMWVs, or 201 M198 Howitzers. The most publicized mission was assisting the 502d Engineer Company build a float bridge across the flooded Sava River allowing the 1st Armored Division to cross into Bosnia on 29 and 30 December 1995. When the river flood washed away the equipment, the CH-47Ds quickly resupplied the engineers. Additional improvements may be incorporated into the aircraft if funding permits. The ICH CH-47 is a dominant maneuver platform. So it was built as a "bare bones" program to satisfy the requirements on the 21st century digital battlefield by a new "glass" cockpit. Only 300 of the 431 CH-47Ds will be converted to ICHs, which will be accomplished before 2015. 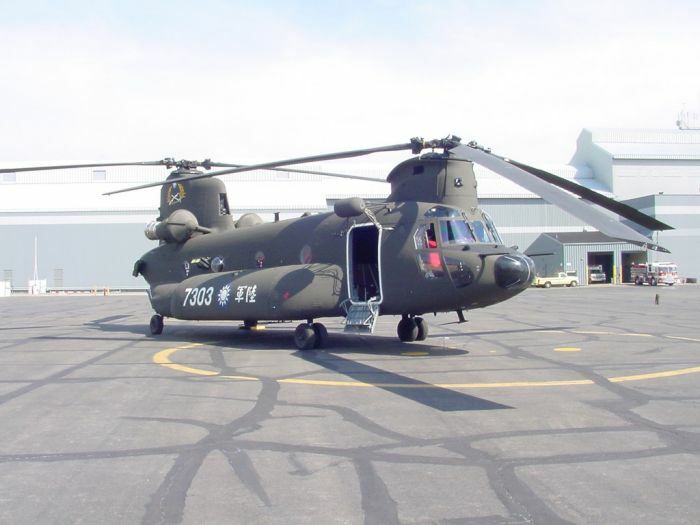 In 2003 the 101st Air Assault Division may receive the first ICH. The 101st, 18th Airborne Corps, Korea, and USAREUR will complete fielding through 2009. The same as the the ICH program proceeding, the 714 engine program is an Engineering Change Proposal (ECP). The engines on all 431 CH-47D aircraft will be convert into the new T-55-714 engine. This engine works much better high altitude or hot temperature and provide an increased lift capability 16,000 pounds for an unrefueled combat radius of 50 nautical miles at 4,000 feet PA and 95`F. The ICH Operational Requirements Document requires exactly the same ability so it will be the CH-47D-714A engine program which achieves the requirement. The 714A budget constantly fluctuates in these years so that the fielding dates may change. Today the three versions of the CH-47 in the Army are CH-47D, MH-47D, and MH-47E, photo on the right. The MH-47 Special Operations Aircraft is called SOA, a derivative of the CH-47. Increased fuel are loaded by modified main and auxiliary fuel tanks. The MH-47D and the MH-47E can be air refueled. The aircraft has new integrated avionics suites, multi-mode radars. These are intended to provide adverse-weather infiltration/exfiltration and support to special activities. The radar system on MH-47E contains AV/ASH-137 Doppler radar & AN/APQ-174 radar which can provide terrain following, terrain avoidance, air-to-ground telemeter and terrain display. The navigation system includes GPS, terrain navigation and AN/ASH-145 course stance system. And there are laser, radar, missle warning systems, pulse jamming, chaff and flare dispensers, coutermeasure radio system. In addition, Forward Looking Infrared (FLIR) system and digital active display are equiped, too. 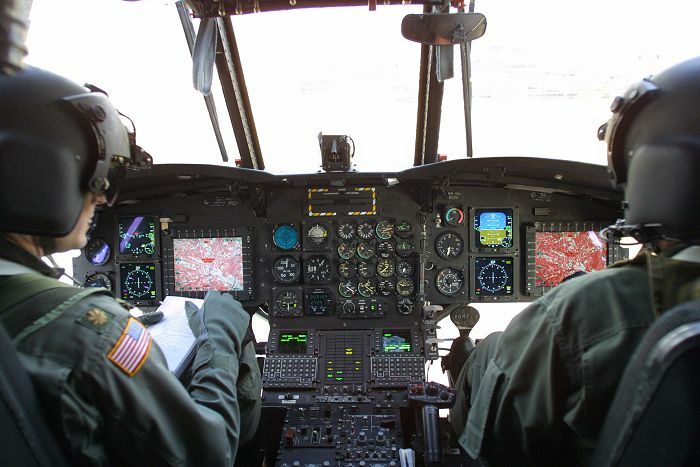 MH-47E cockpit system contains a assignment management of 4 multi function displays and a secondary assignment system. Besides 2 12.7mm machine guns, air-to-air can be carried on MH-47E. The rotors of it can be folded while landing and rotor braking is added, too. Suspensory system is fixed outside the fuselage. The payload is 14,000 pounds, maxium speed 297km/h, useful ceiling 8,700 feet. Now 50 MH-47E are deployed in Army special units. They can be ferried 1,100 to 2,000 nautical miles unrefueled. In the MH-47E, there is an addition of an 800 gallon Robertson Auxiliary Fuel Tank in the cabin and Boeing designed sponson tanks with expanded capacity. The emulational test showed that the greatest potential vulnerability was associated with projectiles entering the fuel tanks in the volume above the liquid fuel. Such impacts would ignite the fuel vapors and cause explosions and/or fires. So an inerting system will be added to the fuel tanks to avoid such problem. The CH-47 is ordered for the Royal Air Force in the late 1970's were equivalent to the CH-47C. They are called Chinook HC1 in RAF service, and updated to be Chinook HC2s, which fitted night vision goggle-(NVG) compatable flight deck. And new-biuld HC2As are on order, as well as HC3A for special missions. The price for CH-47 is 15.9 to 20.2 million dollars according to different variations. 2006年6月，以色列普拉森・撒萨(Plasan Sasa)公司获得了一份为英国皇家空军(RAF)"支奴干"直升机提供防弹套件的后续合约。这家以色列公司是Permali Gloucester公司的转包商，Permali Gloucester公司是英国皇家空军此类防弹装备的唯一供货商。由于成功完成了2003年签订的合约而获得的这个后续项目价值几百万美元。普拉森公司将为"支奴干"直升机提供防弹升级套件以及安装在机舱、驾驶舱地板和墙壁上所需要的所有附件。公司将于2006年6月开始交货并将一直持续到9月，预计2007年会有附加定单。波音公司生产的"支奴干"重型直升机被广泛用于支持英国武装部队在全球范围内的各种类型作战。当前的项目被认为是已经完成的弹道装甲解决方案中最复杂的一个，它解决了不同的平台在不同的战斗情况下的部署需要，并能为整个机舱和驾驶舱的机组人员、部队以及乘客提供最大限度的保护以免受到小型武器的攻击。普拉森・撒萨公司首席执行官丹・齐夫说："我们很高兴在成功完成第一项定单之后获得了这份后续合约。这表明英国皇家空军和Permali Gloucester公司对我们的能力、技术专长以及我们解决方案的质量充满信心。"